Polish yard Conrad is currently building an unusual 35.3 metre ketch-rigged motor-sailing yacht, the Conrad 115, for a client. Constructed from aluminium, the Lloyd's classed and MCA compliant yacht has naval architecture and engineering from Vripack and Polish naval architect Juliusz Strawinski, while her exterior design is by Newcruise Yacht Projects & Design. 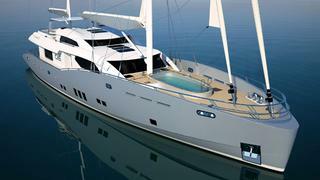 The result is a modern raised-pilothouse motorsailer with contemporary lines. Her wide hull (8.62m) offers a spacious interior, designed by the yard's in-house team, which accommodates up to eight guests on the lower deck in a full-beam master suite and three twin cabins, all with Pullmans and all convertable into doubles. The Conrad 115 is ketch-rigged with twin Lorima carbon masts. Her power back-up comes from twin 725hp Caterpillar C-18 engines giving a top speed of 14 knots, a cruising speed of 12 knots and a possible transatlantic range. Special features include a pool on the foredeck, which is also the berth for the main tender when under way. With the hull and superstructure nearing completion, the Conrad 115 is scheduled to be launched in October 2012.